Competitions like the one for Adelaide Contemporary deliver as many ideas as heroes. Architects including David Adjaye, Charles Renfro, Jing Liu and Bjarke Ingels recently presented their concepts for a new gallery for the Old Royal Adelaide Hospital (ORAH) site – with a mythical primal house, a super-lobby, an open circle and a serpent among the proposals. The project’s arrival in a public forum has been subject to a lengthy political oscillation. Following the failure of a $1 billion scheme involving a private consortium to redevelop the ORAH site in September 2017, the then-South Australian Labor government once again took control of the site with an election in sight. A design competition for Adelaide Contemporary was quickly announced to significant public and professional fanfare, generating 107 teams made up of 535 individual entities from around the world that had registered interests. 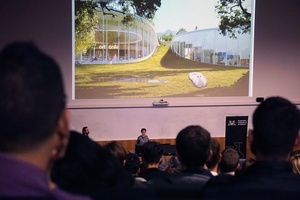 The six shortlisted teams visited Adelaide in January 2018 and this continued to build excitement for the competition (no doubt aided by Bjarke Ingels Instagramming his time exploring the city). However, since the state election in March 2018, which was won by the Liberal party, public energy around the project has retreated as quickly as it formed. 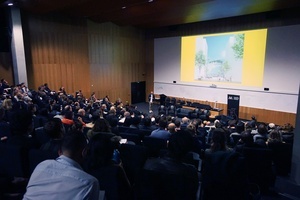 Within a changing political context, the competition regained momentum when the Art Gallery of South Australia opened an exhibition of the shortlisted proposals. Images of the proposed galleries were reproduced again and again, triggering desire for something beyond representation itself. The meeting of the proposals in the forum allowed the competition’s multiple acts of creation to form a singular moment of becoming. For an event celebrating participation, the majority of the forum was occupied by the voices of the competing teams’ local partners (Jing Liu of SO–IL a notable attendee). The diachronic nature of the proposals reflects the forum’s blurring of global and local boundaries. All succeed in critically considering how time is constructed in the notion of the “contemporary,” playing on the gallery’s namesake. These alternative temporalities can be organized around three notions: the eternal, the present and the flexible. Eternal time was best captured in the massive scheme by Adjaye Associates and BVN, presented by Adjaye partner Joao Barroso. The proposed “mythical primal house” is a unifying work that is one-half shelter and one-half gathering space. Kaurna dreaming tracks frame the gallery space across city and country in “an attempt to synthesize between two different ideas of territory.” The proposal encourages an Indigenous program: a fire pit allows smoking ceremonies to guide visitors across ceremonial routes, while the traditional white walls of the gallery are replaced with dark, tactile surfaces. The bold exterior form is clad from a local marble noted for its severe tonal and colour discrepancies (it would be sourced from the re-opening of a local quarry in Kapunda, near the Barossa Valley). These decisions create a gallery that is at once stable and present, yet open and porous; a space rooted in timelessness, devoted to the revelation of country. Contemporary questions of the present arrived in the super-lobby of the Diller Scofidio and Renfro and Woods Bagot proposal, presented by Woods Bagot principal Rosina di Maria. The three-level building of earth, land and sky is intersected by a (super-glossy) super-lobby that connects North Terrace to the park – a process of exchange facilitated by the building itself. The generosity of space acts as a platform, both literal and figurative, for engagement with the present through cultural incubation. The gallery’s intent is to capture multiple voices, making reference to the local typology of the verandah by providing shade, protection and inclusive social space. The Adelaide Contemporary Forum allowed the collision of the four presented proposals to perform a disjunctive synthesis between a quest for the new and a return to the familiar. What were advertisements at the start of the evening was architecture by its end.